The All-In-One Easy 9001 Toolkit™ is an award-winning ISO 9001 package that enables beginners to easily implement ISO 9001:2015 in-house and quickly achieve ISO 9001 certification. It only takes 5 Easy Steps with this comprehensive ISO 9001 solution that's complete with everything you need. a project guide that makes the use of the All-In-One Easy 9001 Toolkit™ clear and easy. You don't need to buy anything else! Every single component of the All-In-One Easy 9001 Toolkit™ is designed for ease of use so that you don't need any prior ISO 9001 knowledge to implement an ISO 9001 quality management system by yourself in-house. The detailed guides and instructions are easy to understand, easy to use and free of unnecessary steps and requirements; the documentation templates are straight-forward, pre-written and only need to be customized following the included customization instructions; the forms and checklists not only make it easy to set up your ISO 9001 quality management system but also to meet all ISO 9001:2015 requirements. In addition, our All-In-One Easy 9001 Toolkit™ contains all you need to implement your ISO 9001 quality management system so you won't spend time and efforts finding the necessary tools. You won't be alone with your ISO 9001 project: the All-In-One Easy 9001 Toolkit™ comes with unlimited free access to our senior ISO 9001 experts to help you. 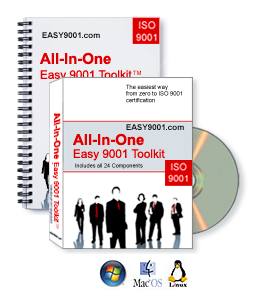 With our All-In-One Easy 9001 Toolkit™ even beginners can implement ISO 9001. Quality Managers: You'll easily get your ISO 9001 project done! Marketing: You'll quickly be able to increase sales using the powerful ISO 9001 certificate! Owners: Your company will save significant costs while achieving competitive advantage quickly! All of the 26 components and over 65 individual tools below are included in the All-In-One Easy 9001 Toolkit™ to achieve ISO 9001 certification in only 5 easy steps. The “Position Description for the ISO 9001 Management Representative” includes a comprehensive description of job requirements, work environment and qualifications of your company's ISO 9001 Management Representative (that's how the the person in charge of ISO 9001 has traditionally been called). The purpose of this document is to provide you with an overview of the requirements of the ISO 9001 Management Rep position, potentially advertise the position, select the ideal candidate, and document the position requirements for this crucial ISO 9001 position. The proper planning for training is a crucial ISO 9001 requirement, and this training plan makes it easy to meet the requirements. The “Training Plan for the ISO 9001 Management Representative” ensures that the important training for the ISO 9001 Management Rep is properly planned, conducted and documented (ISO 9001 auditors routinely ask about this document). Use this memo to introduce your employees to the upcoming ISO 9001 implementation at your company. This memo will give your employees a basic understanding of ISO 9001, tell them what is expected of them, and – most importantly – alleviate your employees of any fear regarding ISO 9001 they may have. In short, the “Employee Memo on ISO 9001” will make the ISO 9001 implementation smoother for you. In addition, you may use this memo to demonstrate to your ISO 9001 auditor that you provided basic ISO 9001 training to your employees. This comprehensive checklist is used to determine the level of ISO 9001 compliance at your company prior to the start of the ISO 9001 implementation. The purpose of this gap analysis is to identify the functional areas in your company that require attention in order to become ISO 9001 compliant. Another use of the “ISO 9001:2015 Compliance and Gap Analysis” is to demonstrate to your company's management where ISO 9001 will lead to tangible improvements. The “ISO 9001:2015 Compliance and Gap Analysis” evaluates your company against 285 criteria. This checklist is an invaluable tool to help you choose the ideal ISO 9001 registrar (the organization that issues your ISO 9001 certificate) for your company's individual circumstances. The “Registrar Interview Checklist” contains 24 important selection criteria that will have a significant impact on the success and on the cost of your ISO 9001 certification. The ISO 9001 quality policy is the most top level document of all the ISO 9001 required documents; it sets the corporate policy on quality for the company. The ISO 9001 standard includes specific requirements for the quality policy. To make it easy for you to establish your company's quality policy in accordance with all ISO 9001 requirements, we are providing you with a prewritten template that you can easily modify to fit your company's circumstances. Detailed customization instructions are included. The “Process Flowchart” is designed to describe the key processes and the overall process flows of most companies. The result: an easy way to meet the ISO 9001:2015 requirements for “a description of corporate processes and their interaction” as you may not even need to customize our “Process Flowchart”. If however, you chose to customize it, simply follow the included step-by-step instructions. The “Scope Statement” describes the scope, boundaries and exclusions of your ISO 9001 quality management system according to several specific ISO 9001:2015 requirements. This template applies all pertinent requirements; detailed, word-by-word customization instructions are included. The “ISO 9001 Quality Manual” summarizes your company's ISO 9001 quality management system and contains the overall requirements. With the newest revision of the ISO 9001 standard (ISO 9001:2015), the ISO 9001 Quality Manual is no longer an explicitly required document (though some auditors argue that one only gained the flexibility to call it by another name). We include the ISO 9001 Quality Manual in this toolkit because it can be a very useful marketing tool, and customizing it is extremely easy and fast. The “Customization Instructions - ISO 9001 Quality Manual” make it very easy and fast to adapt the ISO 9001 Quality Manual to your company's circumstances - just follow the instructions step-by-step and you might be done in less than one hour! Easy Implementation of ISO 9001: This pre-written template has been developed for easy ISO 9001 setup. The customization is very easy and fast if you follow the included detailed, step-by-step customization instructions. Easy Compliance with ISO 9001: Your ISO 9001 documentation, which you will create using this template, will make it easy for your company to actually follow the requirements of ISO 9001 without unnecessary bureaucracy and paperwork. The “Customization Instructions - ISO 9001 Procedures Manual” are easy-to-understand and easy-to-follow, step-by-step instructions on how to edit the procedures templates to make them fit your company. Customization instructions have a major impact on the ease of customization and the quality of the final, customized documentation. We placed particular emphasis on the quality of our customization instructions to ensure that you will be able to develop excellent and individualized ISO 9001 documentation in the shortest amount of time. Work instructions are the detailed, step-by-step instructions that are specific to your company's individual work processes. Our All-In-One Easy 9001 Toolkit™ includes an easy to fill-in work instructions template, plus sample work instructions for the planning of new projects, products and services. Work instructions are typically written by the people performing the work; these two tools are designed to make it easy for them. Our “Set of 32 ISO 9001 Forms & Checklists” make the ISO 9001 implementation and the compliance with ISO 9001:2015 requirements so much easier as each form or checklist allows you to meet one, two or several ISO 9001 requirements in one easy step. These forms and checklists compliment the ISO 9001 Procedures Manual and make it easy to meet its requirements. All forms and checklists are professionally designed for ease of use: they are self-explanatory and they “walk” the user through an entire process (for example, the corrective action process). Due to this special feature, our forms replace many work instructions. All forms are ready for use either as paper form or electronic form. Though our ISO 9001 forms and checklists can be customized if needed, all that's really necessary is to enter your company name and logo. The “Archive Label” is used to identify file storage boxes and to easily meet the ISO 9001 requirements for record retention and record destruction. You will find this easy-to-use label to be a real time-saver. Designed to meet ISO 9001:2015, clause 7.5.3 requirements. The “Calibration Form” is an important part of any calibration program. It includes calibration instructions and calibration records. The form can be easily used for a wide range of devices that require calibration. Designed to meet ISO 9001:2015, clause 7.1.3 and 7.1.5 requirements. The “Corporate Environment Form” is an important strategic planning tool that is used to define the internal and external environment in which the company operates. This form addresses several ISO 9001:2015 requirements related to the 'context of the organization' (ISO 9001:2015, clause 4.1 and 4.2). Our “Corrective and Preventive Action Plan” form (short, “CAP”) walks the user through the entire corrective action process (or the entire preventive action process) – it is not necessary to refer to separate instructions. The corrective action process is a key ISO 9001 requirement; using our self-explanatory form makes meeting requirements of ISO 9001:2015, clauses 4.4, 6.1, 6.3, 8.5.6, 9.1.1, 10.1, 10.2 and 10.3 particularly easy. Resolving a customer complaint in a professional way can turn a disgruntled customer into a satisfied and loyal customer. Our “Customer Complaint Resolution” form ensures that no opportunity is missed to properly resolve every customer complaint. The form includes brief work instructions to ensure that all aspects of this important ISO 9001 requirement (ISO 9001:2015, clause 9.1.2) are met. Finding out what your customers really think of your business is not only crucial if you want to stay ahead of your competition but it is also a central ISO 9001 requirement. Use our innovative “Customer Survey” form as a template for your company-specific survey that allows you to gain valuable customer feedback without taking much of your customers' time. Designed to meet the requirements of ISO 9001:2015, clause 9.1.2. The “Employee Evaluation” form is used for the periodic employee performance evaluation – but it is more than just a regular employee review: we included several sections to cover a spectrum of ISO 9001 requirements in one easy step. Our innovative “Employee Evaluation” form saves you much time and efforts during the ISO 9001 implementation and while meeting ISO 9001:2015, clause 7.2 and 7.3 requirements. Hiring a new employee usually requires various documents, related to government regulations, company policy etc. Use the “Employment Checklist” to make the employment process easy for the hiring manager, to ensure that consistently all required documents are in place for each new employee, and to meet ISO 9001:2015, clause 7.1.2, 7.2 and 7.3 requirements. Many companies are increasingly afraid of firing employees due to the risk of lawsuits. Our “Employment Termination Checklist” is designed to minimize this risk as it includes a 15-point checklist that requires the firing manager to meet important requirements before terminating an employee. In addition, our “Employment Termination Checklist” includes a checklist used after an employee is terminated. Designed to meet requirements of ISO 9001:2015, clause 7.1.2, 7.2 and 7.3. The “Engineering Change Request” (ECR) form is used to have engineering evaluate a concern or improvement suggestion. The “Engineering Change Request” form is comprehensive yet easy-to-use; it includes a section to describe the requested changes (including sketches), a section on effects on products and assemblies, a section for the evaluation and follow-up action. Using this form will save you time and prevent mistakes. The “Interested Parties Worksheet” is used to gather required information for the definition of the corporate environment during strategic planning. This user-friendly worksheet includes instructions for an easy way to meet the requirements of ISO 9001:2015, clause 4.2. The “ISO 9001 Management Review Form” is a particularly valuable form: it is used to keep a record of the ISO 9001 required Management Review Meetings, it includes the agenda points of the ISO 9001 Management Review Meetings, and it includes action plans that allow for easy follow-up. Using our “ISO 9001 Management Review Form” will allow you to meet several ISO 9001 requirements (ISO 9001:2015, clauses 9.1.3, 9.3.1, 9.3.2, 9.3.3, and 10.1); in addition, you will be able to avoid a typical ISO 9001 audit non-compliance. Our comprehensive “Job Description” form allows you to easily meet various ISO 9001 requirements in one easy step. The form includes instructions that help filling out the form. Designed to meet ISO 9001:2015, clauses 5.3, 7.2 and 7.3 requirements. The “Maintenance Form” is an easy way to establish any kind of maintenance program (for example, equipment maintenance, maintaining work environment etc.). The form combines maintenance plan and maintenance records; instructions are included. This efficient form is designed to meet ISO 9001:2015, clauses 7.1.3 and 7.1.4 requirements. The “Meeting Notes Template” is designed to help you gain more benefits from any meetings. Use this simple form to not only keep meeting minutes but to end your meeting with a specific action plan. New employees typically require company-specific training and introduction to the company. The “New Employee Training Plan” is designed to consistently provide the needed training to new employees and keep a record of the training. Designed to meet ISO 9001:2015, clauses 7.2 and 7.3 requirements. Many companies that provide on-the-job training struggle with the ISO 9001 requirements that call for training plans and training records. Our “On-The-Job Training Plan” allows you to easily meet these important ISO 9001 requirements virtually within a few moments. Designed to meet ISO 9001:2015, clauses 7.2 and 7.3 requirements. The “Operational Planning Form” is a 10-step checklist for the planning of new projects, products or services. This important ISO 9001 form makes it easy to meet the ISO 9001 requirements on operational planning and control (ISO 9001:2015, clause 8.1) – you don't even need to refer to the “ISO 9001 Quality and Procedures Manual”. The “Opportunity Management Matrix” is an easy-to-use tool to manage opportunities that could benefit your company. The form enables you to easily generate a priority number, which will be used to identify opportunities that should be further pursued. This form includes instructions to make it easy to meet ISO 9001:2015, clauses 6.1 and 10.1 requirements. The “Pre-Employment Checklist” is designed to make your hiring process more consistent and avoid missing important steps during the employee selection and hiring process. Easily customize this checklist to meet the requirements specific to your company. The “Process Change Form” is designed to guide the user step-by-step through the ISO 9001:2015 requirements for process change, including review and follow-up action. The form is easy-to-use and self-explanatory so you can easily meet the requirements of ISO 9001:2015, clauses 8.5.6. The “Process Definition Form” is a comprehensive form that addresses the numerous aspects of process management and simplifies compliance with the requirements of ISO 9001:2015, clause 4.4. The “QC Inspection Form” is used for any type of quality control inspection during the production process or prior to release to the customer. The form includes inspection instructions, inspection criteria and checklist, and a section on handling QC-failed products. Designed to meet the requirements of ISO 9001:2015, clause 8.6. The “Receiving Inspection Form” is an efficient tool to facilitate and document the inspection of received raw materials, parts, or other items that are crucial for the company's production or service provision. The “Receiving Inspection Form” can easily be customized to include your specific inspection criteria, inspection method (100% inspection or sampling method). Designed to meet ISO 9001:2015, clauses 8.4 and 8.6 requirements. ISO 9001 contains specific requirements for record retention. Our “Record Retention Guide” is a very valuable template enabling you to easily establish your company's own record retention policy and make it available to all staff, thus easily meeting this key ISO 9001 requirement (ISO 9001:2015, clause 7.5). The “Risk Management Matrix” is an easy-to-use tool to manage risks that are potentially harmful to your company. The form enables you to quickly generate a priority number, which will be used to identify severe risks while filtering out unimportant risks that don't need to be addressed. Designed to meet ISO 9001:2015, clauses 6.1 and 10.1 requirements. The “Supplier Disqualification Form” is used to handle problems with an established supplier and to eventually disqualify the supplier; the form also contains a section on re-qualification of the supplier. The form is self-explanatory, making it easy to meet the requirements of ISO 9001:2015, clause 8.4. The “Supplier Review Form” is designed to make the selection of new suppliers more efficient and transparent. With this form, it is easy to focus on the most important features of any new supplier and compare several supplier candidates in order to identify the best choice. Designed to meet ISO 9001:2015, clause 8.4 requirements. The “SWOT Analysis Worksheet” is used to gather required information for the definition of the corporate environment during strategic planning. This user-friendly worksheet includes instructions to make it particularly easy to meet ISO 9001:2015, clauses 4.1 requirements. The “Training Evaluation Form” is designed to make your employees evaluate training sessions by focusing on the benefits to the company. Use this form to make your in-house training more efficient and to evaluate training providers. The “Training Evaluation Form” can be used to easily demonstrate compliance with several ISO 9001 requirements (ISO 9001:2015, clauses 7.2, 7.3, 8.4 and 9.1.3). This professionally designed “Training Plan” template allows you to not only meet the three ISO 9001 requirements for the planning of training, evaluation of training, and maintaining training records easily; it also requires considering the benefits to the company before actually approving a training request. The “Training Plan” has a double benefit: it allows you to easily meet key ISO 9001 requirements (ISO 9001:2015, clauses 7.2 and 7.3), and it potentially saves your company much unnecessary training expenses. Our “Training Record Form” is not just a sign-in sheet to keep the ISO 9001 required training records. We designed the “Training Record Form” to focus on training objectives and potential follow-up training, in addition to easily establishing all ISO 9001 required training records (ISO 9001:2015, clause 7.2) in one easy step. Most companies will find that our ISO 9001 forms and checklists will need very little customization. However, we prepared these simple “Customization Instructions - ISO 9001 Forms & Checklists” to give you guidance in case that your company's circumstances require additional modifications. This “Set of 10 Employee Newsletters” is designed to educate all employees in ISO 9001, to keep them involved and to keep them aware of the company-wide ISO 9001 implementation effort. Employee acceptance and involvement is crucial for the success of ISO 9001, and this series of easy-to-read and eye-opening newsletters will make a great contribution. Topics include updates on the ISO 9001 implementation project, changes to corporate procedures, ISO 9001 facts, flowcharting basics, document control tips, and much more. This professionally designed PowerPoint presentation is a great tool to keep employees and management involved in the ISO 9001 implementation and train them in important ISO 9001 issues. Topics of “ISO 9001 for Everybody” include: What is ISO 9001, Quality Management versus Quality Control, Process Approach, Documentation Requirements, Factors for Success, How to implement ISO 9001, Writing Instructions, and many more. The “Internal Auditor Position Description” includes a description of job requirements, work environment and qualifications of your company's internal ISO 9001 auditor. The purpose of this document is to advertise the internal ISO 9001 auditor position, select the ideal candidate, and document the requirements for the internal ISO 9001 auditor position. The “Instructions for Internal ISO 9001 Audits” will make auditing easy for your company's internal auditor. These instructions, though concise, are a valuable guide loaded with details. Your company's internal ISO 9001 auditor will use the “ISO 9001:2015 Audit Checklist” as an invaluable and time-saving tool that makes any internal ISO 9001 audit as easy as possible. The audit checklist will not only guide the auditor through the entire ISO 9001 audit (using the process approach), but it is also used to accurately record all audit findings with direct references to the correct ISO 9001 requirements. A separate section of the “Checklist for Internal ISO 9001 Audits” is designed to make the audit of executive management as easy and painless as possible. The “Audit Report Form” is used by the internal ISO 9001 auditor to document and communicate the findings of the internal audit. The form is professionally designed to be clear and easy to use while, at the same time, present the complete audit findings to company management in a professional manner. This concise guide will help you define a powerful marketing strategy in order to reap the full marketing benefits of your ISO 9001 certification: increased sales, increased market share and increased profits. Put the numerous tips and instructions of “Powerful Marketing of your ISO 9001 Certification” to work as soon as you passed your ISO 9001 certification audit, and start leveraging your ISO 9001 certification through successful marketing. You are not alone during your ISO 9001 implementation! Our team of senior ISO 9001 experts is standing by to assist you with personal customer service throughout the entire ISO 9001 implementation project. Please contact us anytime 7 days a week, and you can expect a competent and detailed response that addresses all your questions. The All-In-One Easy 9001 Toolkit™ is periodically reviewed and revised (last in July 2017) to ensure that it is up-to-date to the latest requirements and interpretations of ISO 9001, as well as remains fully compliant with all requirements and agreed interpretations of ISO 9001:2015. Complete ISO 9001 package that includes everything you need to start your ISO 9001 implementation from the very beginning and reach ISO 9001 certification easily and quickly without prior experience in ISO 9001. Designed to allow you achieve ISO 9001 certification easily, quickly and without unnecessary changes to your company. This way you can quickly start reaping the powerful marketing benefits that come with ISO 9001 certification. All components of the All-In-One Easy 9001 Toolkit™ are user-friendly, straight-forward and easy to understand. you are anywhere from complete beginner to expert in ISO 9001 quality management systems.